Soar through the lightning fields while you KLAX IT UP!!! Another falling-block puzzle game so soon after all those other falling-block puzzle games? Why the freak not. After all, Tetris was a world-conquering hit. People seemed to like Columns for some reason. 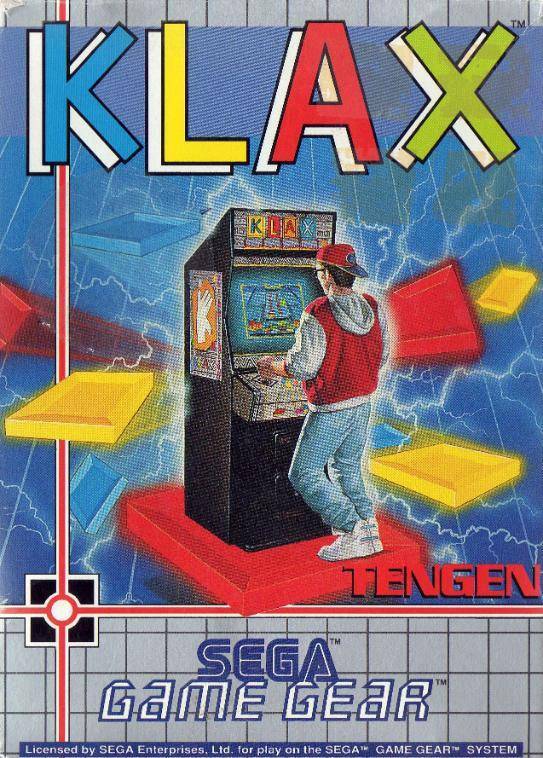 It was only natural for Atari to assume that Klax would be a puzzle bash, a real arcade smash. Time for what?… Time for what?! 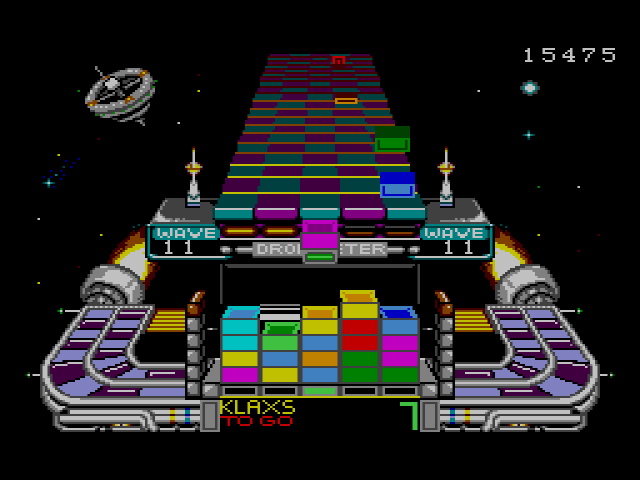 Just as Tetris was the only puzzle game that mattered in the late ’80s, Atari wanted Klax to represent a new decade. 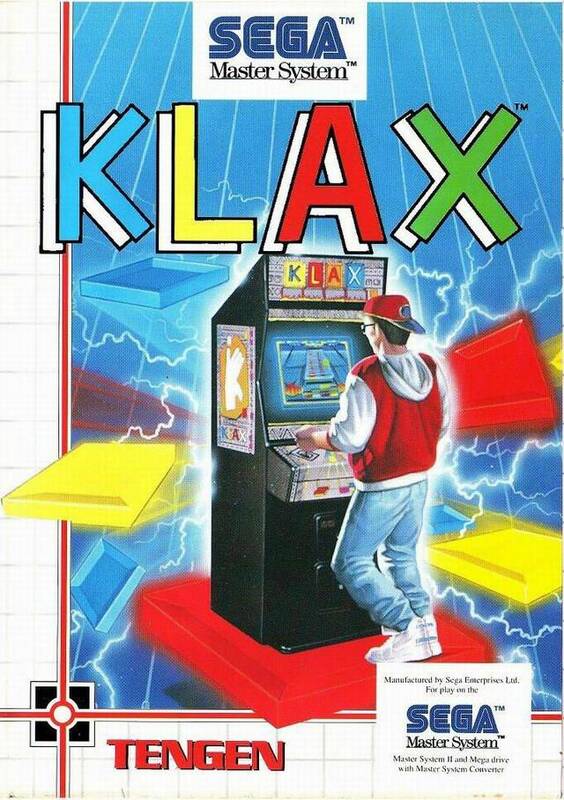 The slogan that appears before the game says as much: “It is the Nineties and there is time for Klax.” No subtlety there! Atari was banking on Klax to do well in the arcade while the Tengen version of Tetris was held up in the courts with Nintendo. 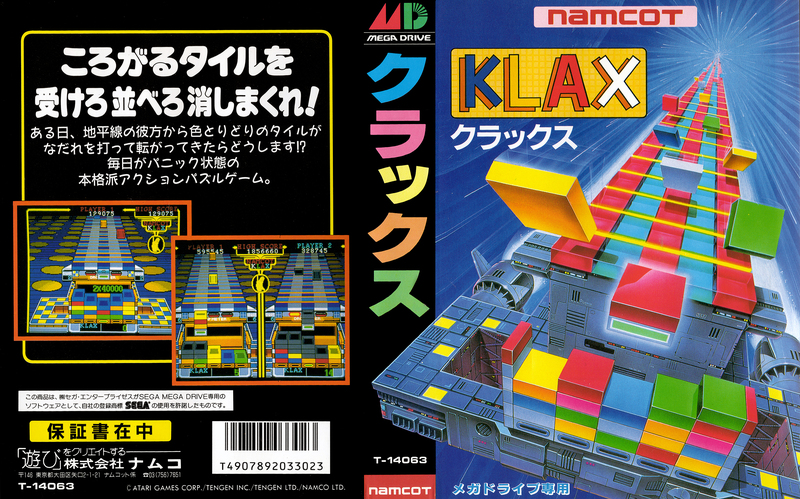 If the court sided with Nintendo (which they eventually did), they’d have Klax to fill the puzzle void on the console front. Time to break some hands, got it. 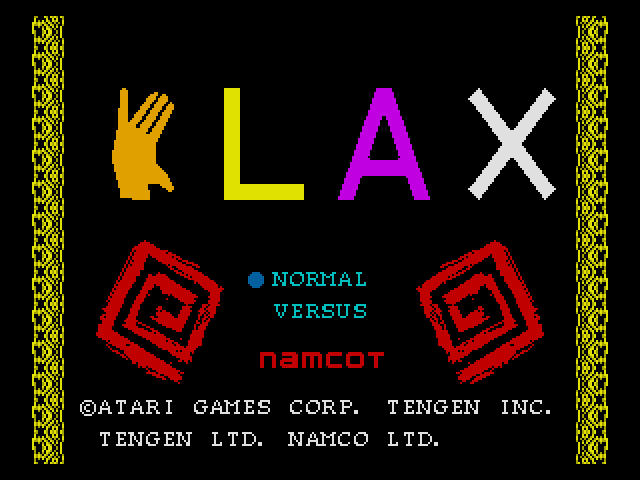 Klax takes a slightly different approach to other games in this specific genre. Rather than have pieces/blocks fall from the sky onto a playing field, the multi-colored tiles tumble down from a conveyor belt onto a paddle. If the tile doesn’t land on the paddle, it will scream and fall into the abyss below. As the tiles land on the paddle, you flip them down into a 5×5 bin below. The paddle can hold up to five tiles at a time, and you can also flip the tiles back up onto the belt. In order to make the tiles disappear and get a Klax, three of the same color tile must be arranged horizontally, vertically, or diagonally. Diagonal wave and bake, bruh. 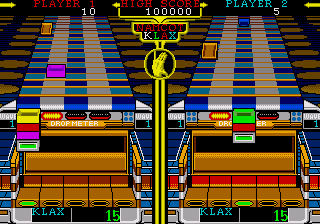 Different Klax shapes result in varying amounts of points. The harder the shape is to make within the bin, the more points you get. 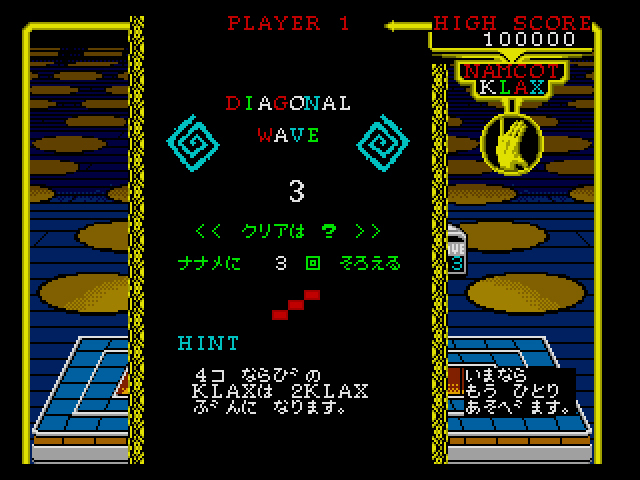 For example, a horizontal Klax is worth 50 points because it’s easy to achieve, while a diagonal takes more work and is worth 5,000 points. The emptier the bin at the end of the wave, the more bonus points you’ll receive. But if the bin fills completely with tiles or if you drop a certain amount of tiles, your Klax-ing days are over. The tiles have hustle, I’ll give ’em that. 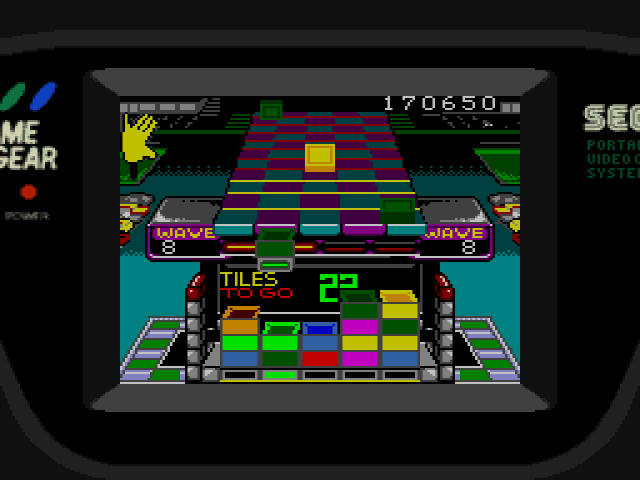 Rather than just making Klax and moving on to the next round where the tiles fall faster, each round (or “wave” as they’re called here) comes with an objective. The five different objectives include: making a certain amount of Klaxes, making a certain number of diagonal or horizontal Klaxes, catching a specific number of tiles on the paddle, and getting a specific point value. These goals add substance and life to an otherwise repetitious puzzle game. Without them, Klax would be a flashy Tetris wannabe. 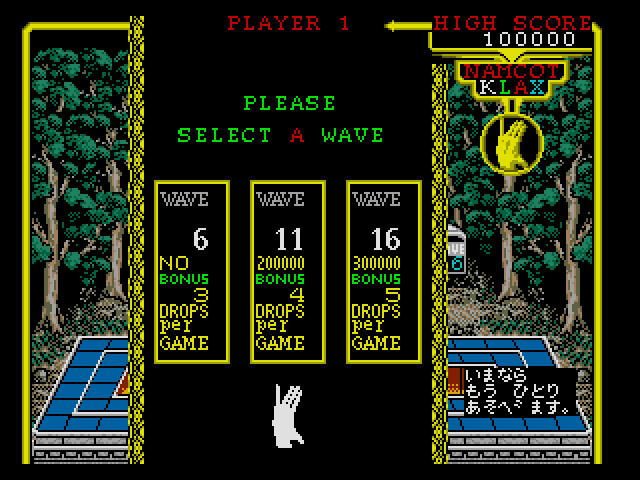 Every five levels, you can select between three different waves. There are indeed two different versions of Klax for the Mega Drive/Genesis. One was published and developed by Namco and released only in Japan. The other was released in the United States/Europe, was published by Tengen, and developed by Atari Games, who also developed and released the Klax arcade. The Namco version preceded the Atari version, and in my opinion, is the better of the two. This, despite the fact that the Atari version was programmed by Klax‘s original programmer, Dave Akers. The Namco version has smoother controls, unlimited continues, crisper graphics, an easier learning curve, a co-op versus mode, and some fantastic voice samples. Hearing the Japanese announcer say “very good!” after I cleared a round always made me smile. Look at all those bonus points. Very good. 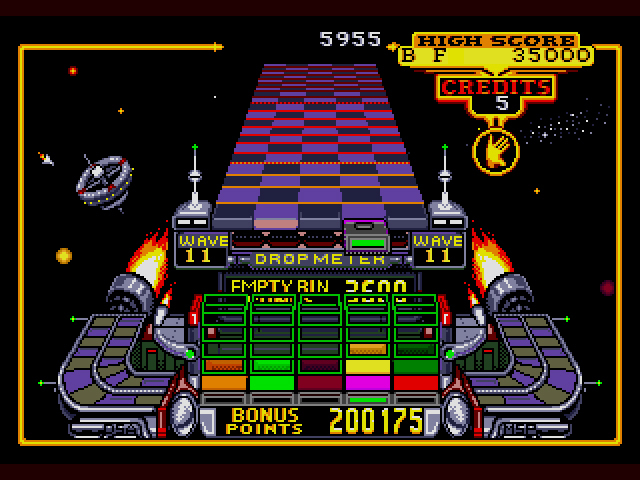 The Atari version is more faithful to the arcade game, though, and also features more options. You can adjust the difficulty so the game either gets more difficult over time or doesn’t increase whatsoever. The music and sound effects can be switched on or off. You can choose different colors from three different tile palettes. But with options comes sacrifice. The co-op versus mode is missing. The continues depend on how many “credits” you “insert” (you can have up to 21 credits, but still). The paddle doesn’t slide as elegantly across the conveyor belt. The graphics are darker, faded, and the American voice samples are shrill and annoying. That blue nail polish really ties the level together. But why are there two different versions of Klax? Greg Sewart of Generation-16 said in his Klax (Tengen) video that he contacted the game’s programmer Dave Akers to see how this happened. Akers responded by saying that Namco’s Mega Drive version was a “complete surprise” to the Atari team. Especially since the American team was already preparing a Genesis version at the time of the Mega Drive version’s release. But can your version of Klax do this?! (thanks to HG101 for the screenshot). 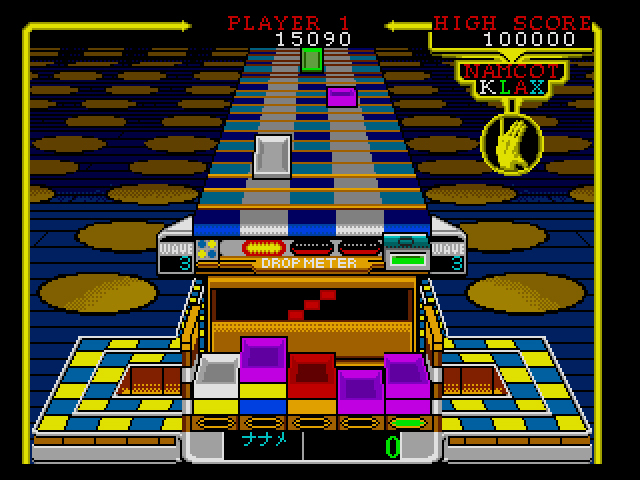 Akers theorizes that Atari’s Japanese division immediately struck up a deal with Namco to get a Klax home version released before any clones of the game could be produced. Though clones of popular arcade games were largely a thing of the industry’s past, Atari was still worried that other developers would get wind of Klax and quickly develop a clone, beating them to the market. As for why the American development team never knew about the Mega Drive port? Aker graciously calls this “a quirk of the Japanese management style.” Seeing as how Sega’s mid-90s implosion can be partially attributed to poor communication between American and Japanese divisions, this would not surprise me in the least. Live long and Klax, I guess. While I prefer the Japanese Mega Drive version of Klax, the Atari-developed Genesis version will still scratch that tile-slinging itch. 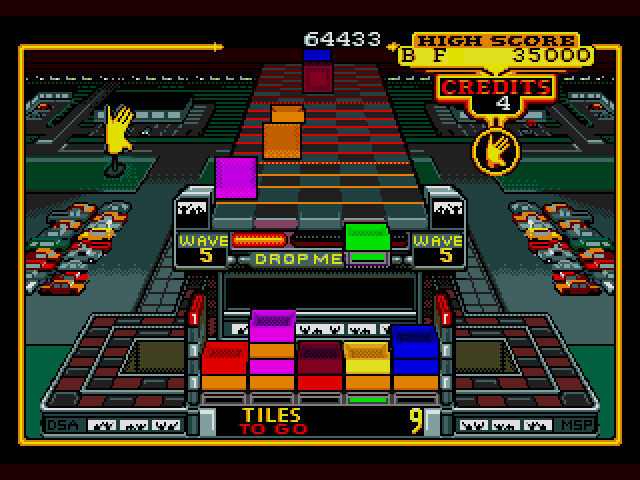 Klax isn’t a Tetris-killer by any means (unless you’re talking Tetris on the Genesis, in which case it absolutely slays), but the game has more depth than you might expect upon initial play, and completing the objectives to get to the next wave can be addicting. Klax on, you crazy tiles. Warning: tiles may disintegrate unexpectedly. 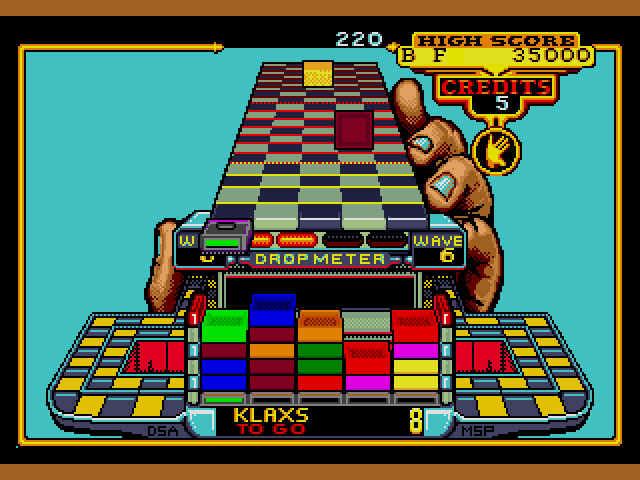 Klax was released on pretty much every console, computer, and handheld available back in the early 90s, so it was only natural for the Master System to receive a port. The catch? This one was just for Europe and Australia, presumably since America had all but abandoned the Master System by 1991. 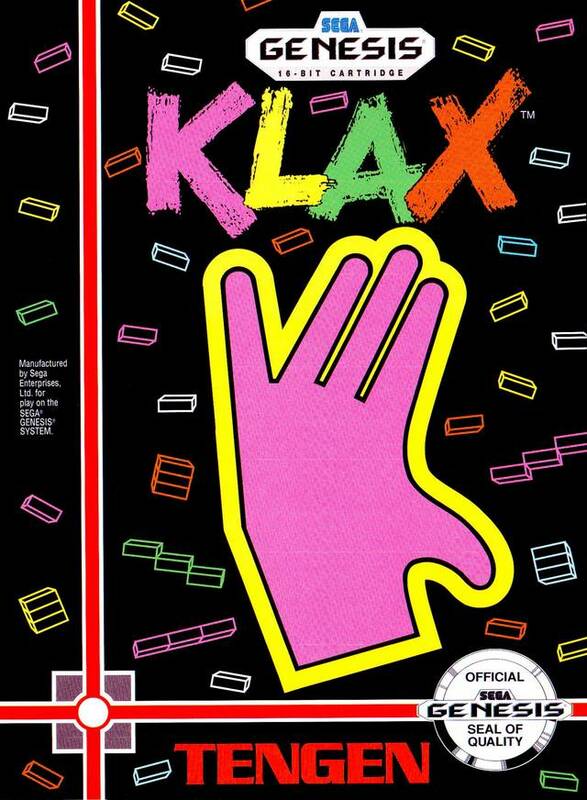 +5000 sympathy points if this is the only version of Klax you’ve ever played. The changes are strange. The paddle slider is more slippery than either the Genesis or the Mega Drive version, which can make catching and releasing the tiles a crapshoot. 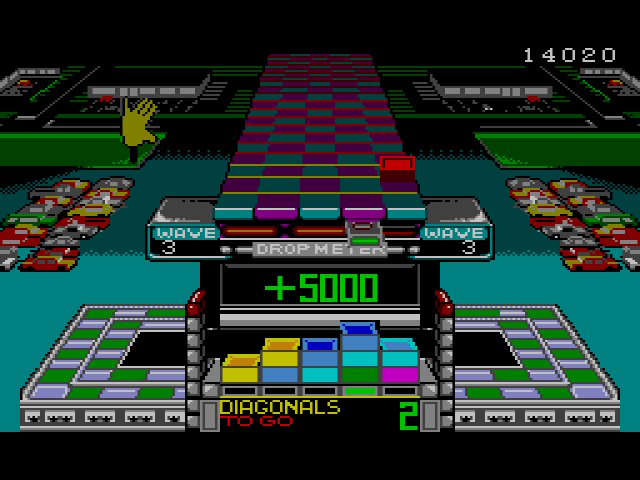 The tile colors don’t alternate down the conveyor belt as often as in other versions. I’ve had five of the same color come down the conveyor belt, one after the other, something that was never an issue before. You only have three credits, which is great if you want a challenge, and bad if you want to get into the higher waves. And it should go without saying that the Master System’s lower color palette makes the game look ugly. Klax is Klax, but since you can play it about a thousand different ways, I’d suggest looking outside of a dated 8-bit console for your fix. Porta-Klax, for the hip young consumer on the go. No foolin’. 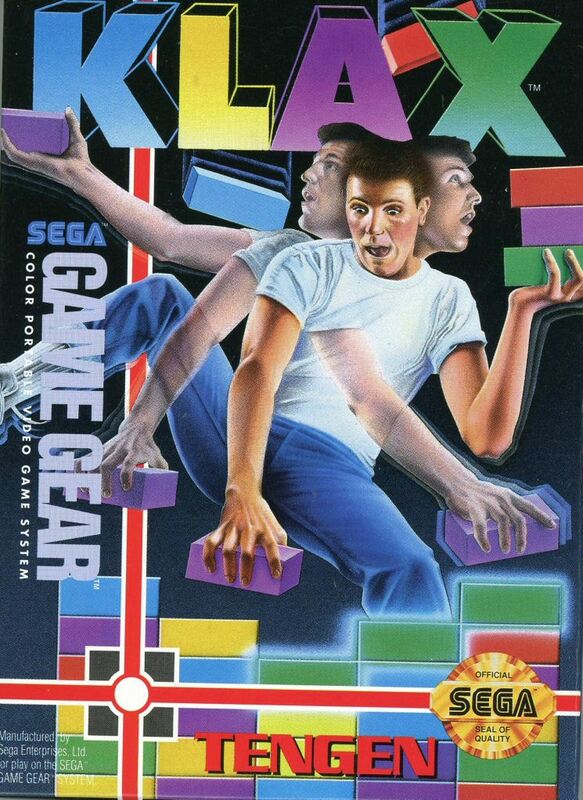 This Game Gear version of Klax is exactly the same as the Master System version. All of the latter’s quirks and annoyances are here: slippery paddle, three credits, repeating colored tiles. The colors might be a little less faded on this version, and the screen is smaller so you can no longer see the background parking lot, only the conveyor belt and the bin. Otherwise, no differences. This is Klax. See Klax clack. 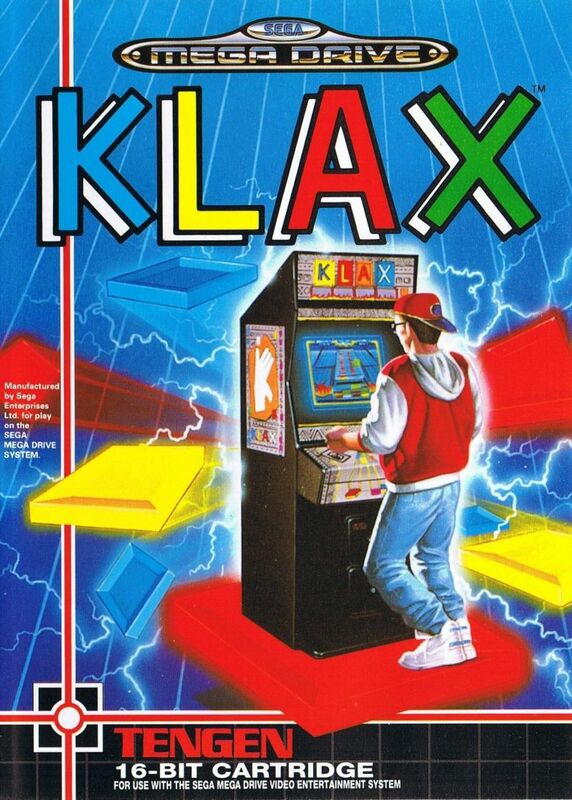 Clack, Klax, clack. In 1992? Sure, Klax on Game Gear would have kept you company while you and your fam rolled over to Disney World. There’s no reason to bust out Sega’s portable buddy in our High Definition Times, however. Especially if you’re playing a game like Klax that has several different and better versions. The Game Gear may have been the best color handheld at the time (sorry, Lynx), but the blurry screen and appalling battery life don’t make for friendly playing today. Interesting stuff on the Japanese and American games there, Dylan, seems daft that Atari would go to all that trouble. Having read ‘Service Games: The Rise and Fall of Sega’ though, I know SEGA will go on to do much worse than Atari here…. As for Klax? 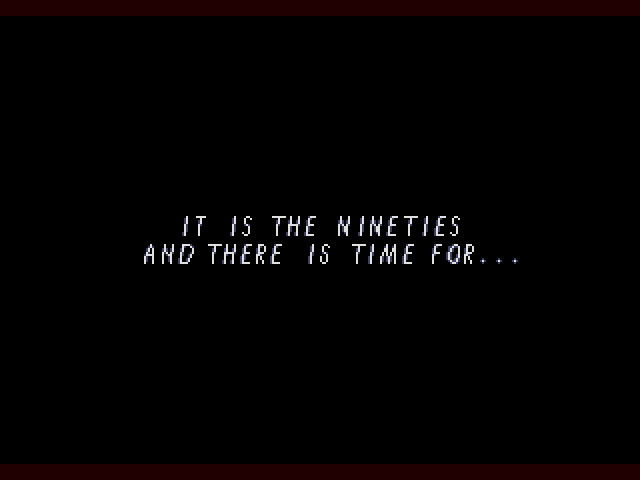 Good game, but I think the 90’s forgot it pretty quickly. It was 1990 and there was a few minutes for Klax. Do either of these have the blob ball mini-game that was on the NES version? I did not see it, nor did the instruction manual make mention of it. This was a permanent fixture in Australian bargain bins back in the day but I never tried it. Are the objectives in the Namco version easy enough for a non-Japanese speaker to follow? They definitely are. The Namco version is highly recommended. Thanks Dylan – added to the list! I just took a look at the next few games on your review list – looks like some good times ahead! I hope so! Tis the season, etc. Klax – 4 reviews for the price of one. Always found this game a bit ‘meh’ . Look, the Genesis version has 2p mode. The difference is the Namcot one is the only one with competitive 2p mode (ie 1p actions affect the second player and vice versa). Genesis / EU has regular 2P mode. I think the Ackers version is more accomplished overall.